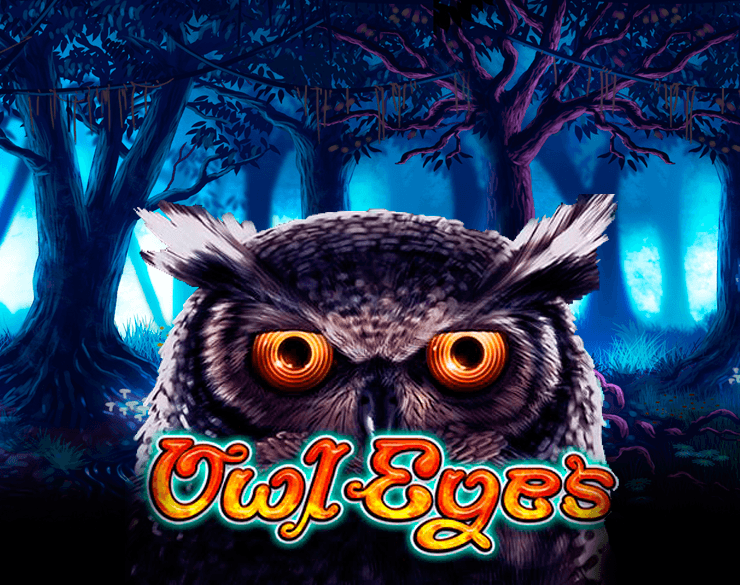 Stare into the eyes of the wise, old owl and venture into the mystical wood to try your hand at this 5 reel slot game when you click to play online slots. Uncover enchanted trees, random toadstools and discover the riddles of the wood and be rewarded generously with free games and scatter bonuses. 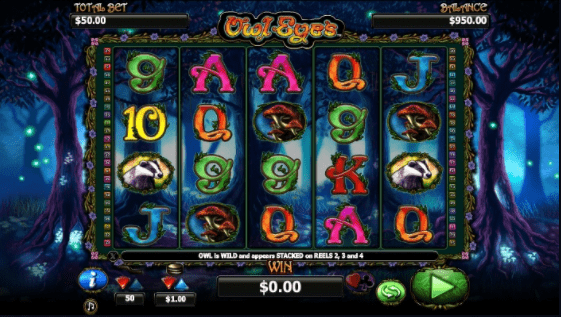 NextGen gaming has long been a purveyor of some of the best spin slot games on the market and they do not disappoint when it comes to Owl Eyes. The team at Wizard Slots enjoyed a healthy number of spins on this 5 reel and can assure you that it’s well worth a spin, Next Gen have really pulled it out of the bag and cemented there place in gaming history following their foundation in 1999. 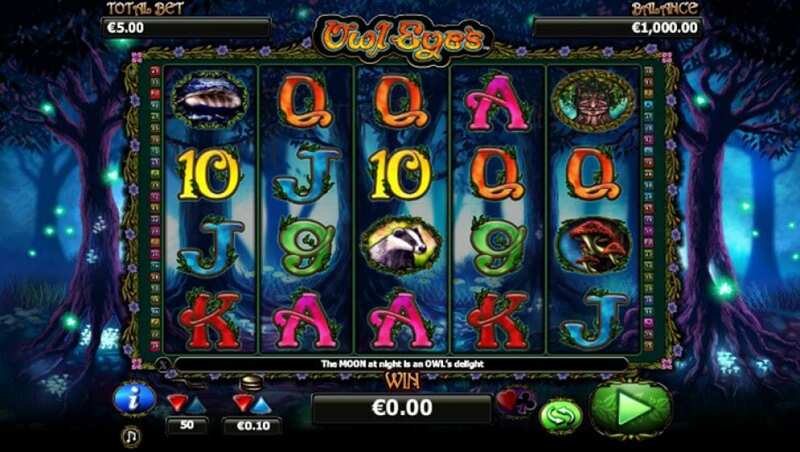 Owl Eyes is a lovely 5 reel slot machine with a huge 50 paylines and four main rows. This is one of the more archaic instalments from the gaming developers NextGen but nevertheless acts as a personal favourite for many gamers and customers, globally. Enjoy the deep and immersive colour scheme and transport your body and soul into the depths of the mystical forest under the watchful eyes of a thousand strong parliament of owls. If you’re looking for a one-word catch-all to pin downpopular online slots like this one then you could certainly suggest the word ominously. Enjoy the no risk feature of free mode and get to grips with this wonderful game before you place your bets. Bets can be placed for as small as a penny or as large as £100, meaning this is a game that’s adapted for a whole range of gamers and adds a bit fun, excitement and thrill to a game that would otherwise be slightly dull if you weren’t playing for real money. However, it is worth cutting your teeth on the free mode for a short while to get an understanding of how the game works. Enjoy the mystical design and the glistening magical forest that foreshadows the reels that consist of a range of extremely detailed and groovy letter and numbers. These symbols make up the lower valued icons and the mushrooms, animals, and particular the badger symbol make up the icons that are really going to help you draw in some wealth. The artwork on this game is a work of art on its own so you will be forgiven for staring at the background for a little while between each and every spin. In addition to all these amazing features, there are also some great bonus rounds that can keep even the most ardent of gamers excited for hours into the night. 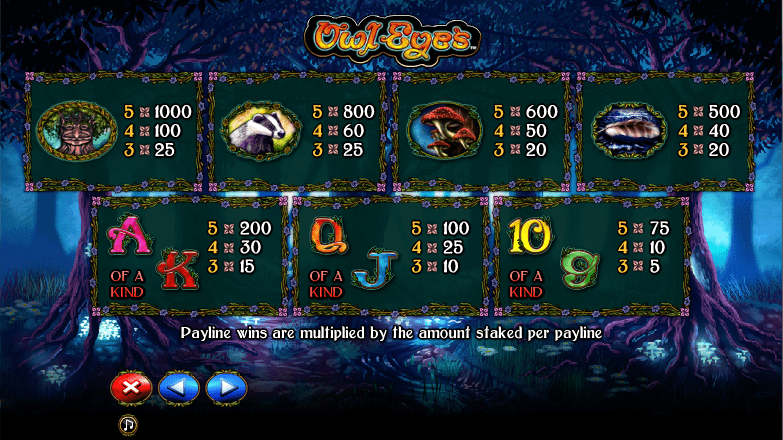 These additional bonus games can be triggers when various symbols are matched with the elusive wild symbol. This symbol is impossible to miss as it is apparent when the scrawny face of the old, wise owl appears on your screen. The first feature involves accumulating free spins by matching the full moon scatter symbol across the paylines to achieve 5 free spins. Amazing! Secondly, there’s also an option for the risk taker; the gamble option gives you the power to double or quadruple your latest win by correctly guessing the order of colours or the suit of a playing card that will be presented to you following each spin on these additional rounds. This is one of the best games on the market right now, you simply have to try it out. Enjoy amazing and detailed graphics and a delightfully ominous atmosphere that transports you straight into an occult world of witchcraft and staring owls. Also, you may just win yourself a small fortune. Another great game for you to try is jack and beanstalk slot.